vco action on & off the courts! Young tennis players take a clinic on center court! 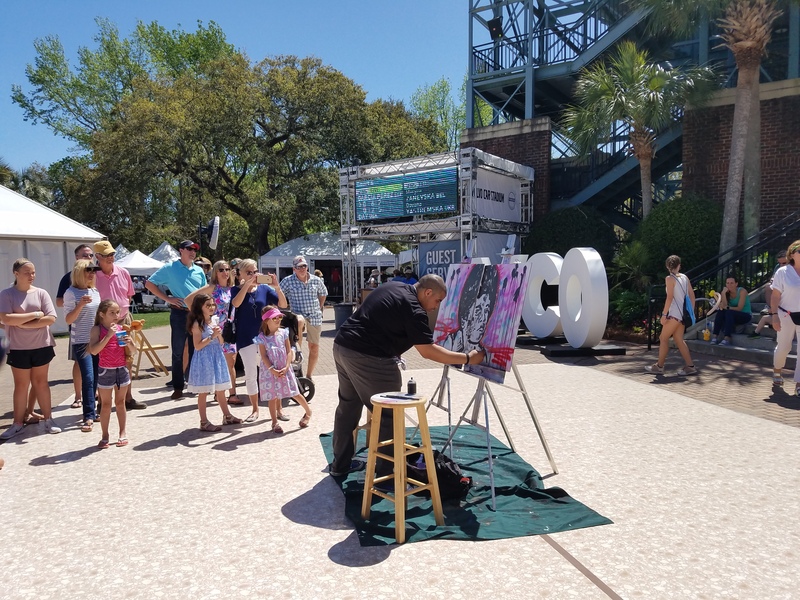 Speed painter Christopher Johnson drew a crowd of observers as he painted this young Michael Jackson portrait in about five minutes while jamming to the King of Pop’s music. For more information visit kolpeace.com. Will Ramey of Daniel Island drew a chip during the Draw Party at Dockery’s on Saturday. Pam Whytcross of the WTA, players Christina Mchale and Kiki Bertens, and VCO tournament executives Bob Moran and Eleanor Adams gather at the conclusion of the official draw. Kyle Kotic, aka Superman, flips over the Easter Bunny and members of the crowd for the finale of the strongman and break dance show the crew performed over Family Weekend at the VCO. Easter Sunday at the VCO! Fans played some tennis, enjoyed the holiday spirit, and saw the pros in action during the qualifying rounds.